The Fleet Half Marathon was to be my main “tune-up” race in preparation for London. Most marathon coaches and experts suggest you should do at least one half marathon race to test yourself and get used to racing conditions. It can also give you an idea of what kind of time you can expect to run in the marathon itself. The Fleet Half is marketed as a pre-London event and has been running since 1981 so it seemed an ideal choice. Reading Half Marathon was also on the same day but this seemed more difficult to get to and would be busier. My main concern about this event was the weather. I’d been checking the forecast all week and was convinced the race was going to be a windy washout and scupper my chances of getting a good half marathon time in the build-up to London. It has not been a great few months of weather for any kind of outdoor activity. As predicted the heavens erupted on Sunday morning. I could hear the rain in bed at about 5am on the morning of the race. Fortunately it had eased by the time I got out of bed went for a ‘shakeout’ run at 6am. This is a elite-endorsed ritual I've started doing the morning of important races. It’s nothing complicated or strenuous and simply consists of a short jog to loosen up and prepare the body for later exertions. I need to get up early for breakfast anyway so it doesn't affect my alarm clock too much. On my return I showered and had breakfast before Sarah and I started the journey to Fleet, in Hampshire. One of the nice things about racing is that you get to visit places that you otherwise wouldn't come across. It was only an hour on the train from Waterloo and then a 20 minute walk to the start from the station. The inclement weather made the build up to the race pretty miserable and served to make me even more stressed out than usual. Lots of rain always makes things more difficult – especially when the HQ is in a big grassy park, which predictably descended into a mud bath. It has to be said, the organisers did a great job in the conditions. The race started on time on the main road. I was a little frustrated at the start as got stuck behind some runners going at a slower pace which meant I had to compensate for this once I’d got past them. The field was of a pretty high standard so we were a bit bunched up for the first mile or so. I clocked a couple of fast miles and then tried to steady myself into a rhythm. The course was a difficult one to pace because of a lot of undulations. Fortunately there seemed to be a lot more uphill than downhill, however declines do take a lot out of your legs. The support from the public was exceptional for a race of this type and the frequency of support was helped by the route taking in the town centre twice. Even in the more rural areas we came across fantastic support. There were also a lot of families supporting their loved ones with homemade signs. I struggled with a couple of miles and posted longer split times due to both tiredness and a couple of inclines. It’s always harder to push on with wind and rain in your face as well. I couldn't have paced the race too badly as I started to take over more and more runners and and was advised by marshals that I was around the top 20 mark. By 9 miles I was starting to feel the pain but knowing I had only had a few miles to go I just kept pushing on. I was very relieved to see the sign for ‘Fleet’. The best thing about the last mile was the amount of downhill sections – a decline is always a very welcome sight as far as I'm concerned and it meant I was able to put in a couple of very fast miles to finish. What isn't a welcome sight is a massive puddle of mud in closing stages! 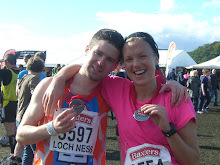 I was honestly worried about losing a shoe as I sprinted through – it was like something from ‘Tough Mudder’. The reward for tackling this obstacle was my first sight of the finish clock. 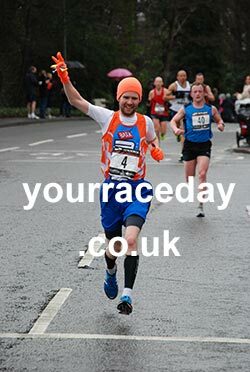 It was still on 1:15 and at this point I thought I had a chance of making sub 1:16 but I hadn't realised there was another bend before the finish line so there wasn't a chance of making it. 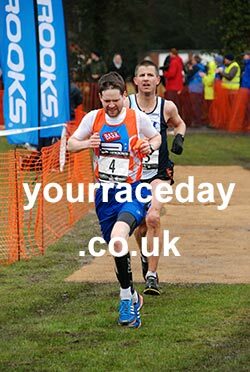 I did however still manage a sprint finish taking over another runner in the process which is always a good end to a race. My official finish time was 1:16:14, a massive PB. It was a strange feeling breaking a PB from 2 and half years ago. I felt on a better day I could have gone under 1:16 but that will come. It was a good day’s work but I still need to force myself to concentrate harder on the pacing aspect of races. One of the most important pieces of advice I have read on the marathon is that the distance has to be respected and what you bank in faster miles early on you will pay back with interest later. Another entertaining race report Jamie with a very respectable position. Your training preparations are obviously taking effect. What a great photo of you waving at the onlookers. I think Sarah deserves a gold medal for each of these races since she makes such an early start on weekend days, travels long distances via public transport and suffers inclement weather conditions. Sarah is Number One Supporter!